could go to bed peacefully. We got up at around 9:30 AM to get breakfast, and chilled around for most of the day until it was close to the round. I reviewed a bit of main-line and sidelines but could not find too many of my opponent's games because of the inefficient internet service. Today was the first round, and we went into our rounds today without too much preparation. I was playing first seed (Karen Grigoryan), an IM with 2484 Fide, and although he is a strong player, I was not affected performance wise by his rating. Everyone is still getting used to Brazil/Caldas Novas but I think most of us are enjoying the best of it. Although the whole resort just blacked out, the power will be coming in soon (hopefully). Most of the Canadian team has brought back good news, and noone lost without a good game (except for mine :()! First round we had 2 players facing top seeds, 1 player facing 2nd seed and a bunch of other Canadians playing against FMs, IMs, etc. Best of luck to all players, and I'm going to recover from this 1st round loss and will hopefully play better tomorrow! After a 30 hour long trip, the Canadian team has all arrived at Caldas Novas, Brazil. The flight was a tiresome journey, but everyone is in the hotel. Most of the team is currently living in the Thermas diRoma Hotel. The hotel is all right, although it's not comparable to '09 Turkey WYCC, it still seems like a fine place and am looking forward to a fun tournament. I will be trying to update this blog every night after the round, so keep in tune! Haven't blogged in a full year but that's okay will start again soon. This year, the CYCC was held in the Sheraton hotel of Richmond Hill, Ontario. The tournament hall was professional, the playing schedule was well organized and the overall tournament was a huge success. I was seeded 6th but at this age I've grown to realize that rating is not that important and I didn't really play Chess while focused about elo. My aim was first, but if not - I'd do my best. This was a very crucial round, as it was my only white for the last 3 round of the tourny. While Tanraj Sohal was 2nd seed of the tourny, I had no choice but to play for a win if I wanted the champion title. He went into a Sheveshnikov side-line which we both didn't know much theory on. To my point of view, I had a decent position as I controlled the d5 square and his king was unable to castle sitting on e7. He opened up the position but my bishop was stronger than his knight and eventually he gave up a pawn for some compensation for my back rank. I found h4 which freed up my king and allowed me to keep the pawn in a QvQ up a pawn endgame. I dawdled around for 30 moves but finally got my king to safety and queened my pawn. 1-0. Coming into this round I was tied for first with Nikita Gusev (5.0/7.0) who drew his previous game. I was black against Mike Ivanov and found that he had a very interesting repertoire. Not only was his openings hard to prepare against, but he was overperforming this tournament and I had to be very aggressive to win this game. He played something that I didn't prepare for but had experience with it in the past, a variation of the Caro-Kann. I thought that I had a good kingside attack planned but I realized there was nothing I could do against his fianchettoed bishop. Soon I found myself to be in an inferior position while also in time trouble. I found a chance to open up my c file and soon my pieces became more active. He missed a tactic which would've gave him a better position and sacrificed a pawn for the initiative instead. At this point, I had a winning position as I locked his g2 bishop in and had a good defense against his attack. Seeing that Nikita's position against his opponent wasn't looking bright, he offered me a draw thinking that I would most likely accept. But unfortunately I didn't have time to evaluate Nikita's position and declined. Moving with 30 or so seconds on my clock and 5 minutes on his, I was focusing my best and trying to move swiftly. I glanced to my left and saw Aquino and Nikita shaking hands as I realized Nikita had lost this game. This meant that if I drew my game, I would become national champion leading my section with just 0.5. I quickly reoffered a draw. I might've not been the strongest player in my section, but with a bit of luck and ambition I pulled through to become the 2011 CYCC U16 Open Champion! All results are posted in sectional order. Buchholz chess rating tiebreak system. I haven't blogged in half a year, because after the WYCC I haven't been focusing on chess a lot and haven't been blogging at all. This will just be a very brief recap of the Alberta team in the CYCC 2010, I'll be posting more about the tournament tomorrow. I (7th seed) played on par with some higher rated players in my U16 section, but I ended up with only 4.0 where I scored some depressing losses in good or dead-drawn positions. Unfortunately I had lost a critical 6th round game in an almost winning position, and could not qualify for the world's as I was behind the tied 3rd players with 0.5. Richard Wang (1st seed) was tied for first in the U12 section with 3 others after round 7, and had won his first tiebreak game, but there are no results on the web yet, so I'll have to wait to edit this post for later reference. His performance is not ideal, as he is 400 points above the second seed but had lost to a 1900 rated player which almost caused him to falter of the top of the standings. I'm very excited to hear good news about his playoff wins tomorrow! Nicka Kalaydina (1st seed) won her U14G section with 5.5/7, only dropping one game to a previous WYCC contender, Rebecca Giblon. Luckily for her, Rebecca had lost her last game which gave Nicka a .5 point lead to win the tournament. Congratulations! Eric Hansen (1st seed) had been leading his tournament after his win against second seed Aman Hambleton in round 3, but his opponents' preparation and his own lack of sleep had led him to have draws against weaker players in the last two rounds, which unfortunately concluded his CYCC with 2nd place and 5.5/7. Yuekai Wang (6th seed) was not having the best tournament start, as he had drawn both a 1360 and a 1650 (approx ratings), and had not gained any superiority in the tournament ladder. But he managed to win his 5-6 round games which gave him a chance for top 3 in the U14 section if he had beaten second seed Tanraj Sohal. Unfortunately, he was tricked in a good position, and ended up with 4/7. Jamil Kassam (2nd seed) was having a pretty good tournament in the U10 section, but when playing 1st seed Yuanchen Zhang, he accidentally flagged in a much better position. He came out strong after that loss and ended up with 5.0/7 in 4th place, with a very high tiebreak score as well. Ian & David McCoullough both performed much higher than their ratings, and David had scored a very nice win in round 5 where he was losing but brought it back with a good pin&win. They finished in 10th and 14th, respectively. Patrick Tolentino had very nice positions against many of his opponents, but he had given up some of his chances in the game and did not win all of them. This is his first CYCC as a U8 contender and he got 7th place out of 15 with 4.0/7! Overall we did score pretty well, but considering our seeding in the standings coming into this tournament, we could've done better. But there are also many other factors that influences how we played, not just our rating level. Anyways, it's already 1 AM, so I'm going to go sleep. I'll edit the post tomorrow with updates on results and additional statistics so stay tuned! WYCC PICTURE :( And VIDEOS! Wow. Turns out I only have one photo for round 7-11. Sorry guys! Credit goes to my dad for taking the all of them. Videos! I want to upload them, but they take up so much space! I'll upload them on YouTube because it's faster and better than blogspot. 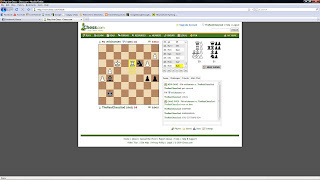 The YouTube channel is http://www.youtube.com/user/DZchess Since it takes a long time to upload, I'll probably only be uploading a few per day. FM Eric Hansen Canada's Best Blitz Player? Lol I played this nub in bullet, 1/0 and this is what happened. 0-1 Defeating FM Hansen as black. Sorry about the WYCC photos, I will get them in tomorrow! Hey everyone! I'm back, and this time I have the internet speed necessary to upload my 10 gigs of photos. Of course I'll only be uploading a few from each round shooting players and the tournament hall. Maybe some scenery. And that'll be pretty much it for the day, I'll be updating with the round 7-11 and closing ceremony photos tomorrow! Stay tuned!